The Six-Syllabled Mantra ‘ OM MANI PADME HUM ’ is the heart mantra of Avalokiteshvara Bodhisattvas (the Ultimate Buddha) and the essence of the Buddhas. its very difficult to translate, but literal translation means, hail to the jewel in the lotus. Gen Rinpoche's definition: The mantra Om Mani Pädme Hum is easy to say yet quite powerful, because it contains the essence of the entire teaching (of Buddha). When you say the first syllable Om it is blessed to help you achieve perfection in the practice of generosity, Ma helps perfect the practice of pure ethics, and Ni helps achieve perfection in the practice of tolerance and patience. Päd, the fourth syllable, helps to achieve perfection of perseverance, Me helps achieve perfection in the practice of concentration, and the final sixth syllable Hum helps achieve perfection in the practice of wisdom. What could then be more meaningful than to say the mantra and accomplish the six perfections? The Theosophist and Mystic H.P.Blavatsky writers, "Om Mani Padma Hum," means simply "Oh the Jewel of the Lotus,"
Esoterically it signifies "Oh my God within me." Yes; there is God in each human being, for man was, and will re-become, God. The sentence points to the indissoluble union between Man and the Universe. 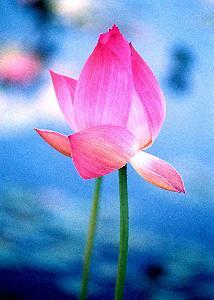 For the Lotus is the universal symbol of Kosmos as the absolute totality, and the Jewel is Spiritual Man or God. Avalokiteshvara - "The on-looking Lord": In the exoteric interpretation, he is Padmapani (the lotus bearer and the lotus born) inTibet, the first divine ancestor of the Tibetans, the complete incarnationor Avatar of Avalokiteswara; but in esoteric philosophy Avaloki, the"on-looker", is the Higher Self, while Padmapani is the Higher Ego or Manas. The mystic formula "Om mani padme hum" is specially used to invoke their joint help. While popular fancy claims for Avalokiteswara many incarnationson earth, and sees in him, not very wrongly, the spiritual guide of every believer, the esoteric interpretation sees in him the LOGOS, both celestial and human. (TG) Agni Yoga. The mantra refers to those primal Light within each of us, Buddhist call it The Buddha Nature, non - dualistic state of mind and clear vision.